These Candy Crush Jelly Level 22 cheats and tips will help you beat Jelly Level 22 of Candy Crush. The objective of Candy Crush Jelly Level 22 is to beat cupcake carl and get 2 pufflers in 15 moves. In Candy Crush Jelly Level 22, the main objective is to beat Cupcake Carl and get 2 pufflers in 15 moves or less. With the right techniques at hand, then achieving the set objective is quite easy. When you create a special candy, Cupcake Carl skips his turn and you are given an extra move. Getting another special candy will as well earn you another special move in Candy Crush Jelly Level 22. This continues until you are unable to make a special candy and you match candies regularly. The main benefit of it is to get more moves that will help you move closer to Candy Crush Jelly Level 22 completion. It will make it easier for you to find pufflers first. Utilize your moves wisely to get special moves, thus beating more cupcakes within the given moves. These Candy Crush Soda cheats and tips will help you beat Candy Crush Soda level 40. The objective of level 40 is to Find 7 bears in 50 moves. 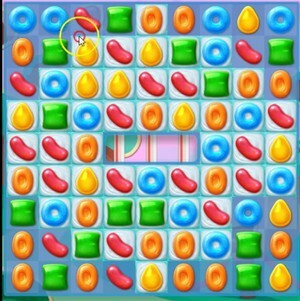 In Candy Crush Soda Saga level 40, use striped candies to peel away layers of blockers. If you can’t wedge a horizontal striped candy in the area of blockers, stick with striped candies. Striped candies will attack entire columns and make it easier for you to locate hidden bears. These Candy Crush level 22 cheats and tips to show you how to beat level 22 of Candy Crush. The goal of level 22 is to bring down 2 ingredients and score 2,500 points in 15 moves. Level 22 Cheat #1: Clear frosting. In order to drop the ingredients, you must clear a lot of the frosting. You should focus on clearing foster first, and then getting all the ingredients down. Just stay focused on getting the frosting cleared for where there are ingredients. These Candy Crush Dreamworld level 22 cheats and tips to show you how to beat level 22 of Candy Crush. The goal of level 22 is to bring down 2 ingredients and get at least 20,000 points in 15 moves..
Level 22 Cheat #1: Destroy the meringue. Since the object is to drop the ingredients through the bottom of the field, you’ll have to destroy these first to have any chance of winning. Use horizontal matches and bombs to destroy as much meringue as possible per move. Level 22 Cheat #2: Use bombs and candies as much as possible. Vertically striped candy can drop an ingredient off the board in one move if they’re in the same row. Use them wisely. color bomb are more useful here than ever, as they can destroy any remaining meringue or remove candy from the bottom that can’t be matched. Click Next Candy Cheat to check out the last tip and video that shows you how to beat the level!